Emmanuel Macron winds up a formal, slightly wooden victory speech to the nation via live tv with the traditional "Vive la France." Looking stern in a dark suit and tie, Macron acknowledges the social and economic concerns which appear to have contributed to a near-record abstention rate and promises to keep France at the forefront of the international fight against terrorism. A more upbeat victory celebration now awaits the 39-year-old new president outside the Louvre followed by weeks of campaigning for French parliamentary elections in June, which will determine his ability to govern and push through economic reforms. We're about to get the first really meaningful official results based on about 20 million out of 47 million registered voters. But as with the first round, at this stage the Interior Ministry results do not yet include the big cities. Warmest congratulations to @EmmanuelMacron on his victory this evening. France and U.K. remain close allies. "The legislative elections must show that after a vote of rejection and fear, it is time to make a positive choice." 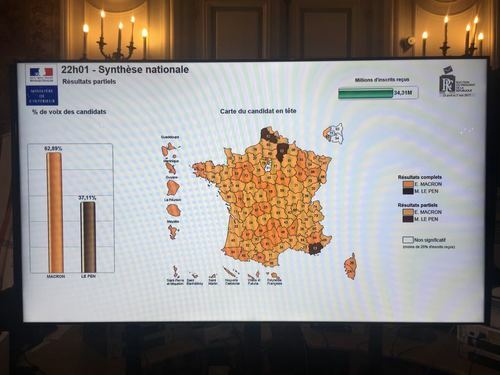 Je défendrai la France, ses intérêts vitaux, son image, son message : j’en prends l’engagement devant vous. Nous avons des devoirs envers notre pays. Nous sommes les héritiers d’une grande histoire et du grand message humaniste adressé au monde. Congratulations to President-elect @EmmanuelMacron and the French people. 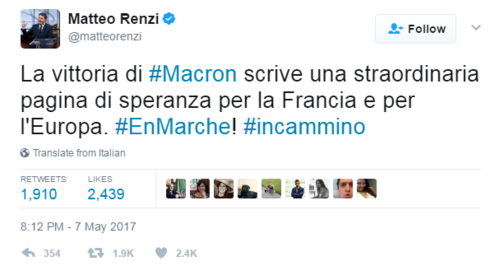 "Macron's victory writes a new page of hope for France and for Europe," writes Italy's ex-Prime Minister Matteo Renzi on Twitter. 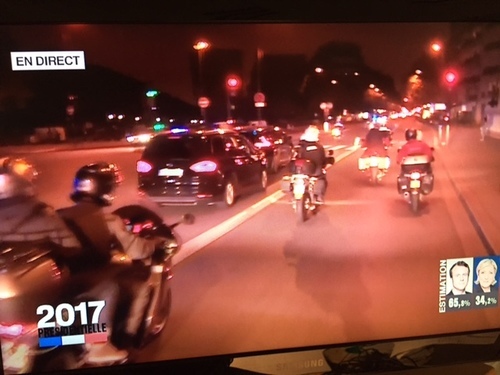 Media partly blamed for Marine Le Pen's defeat at Chalet du Lac, where many supporters left quickly after the far-right candidate gave her concession speech. Michele,46, a nurse, tells Matthias Blamont: "I'm disgusted. I don't see how and when Marine can win one day. Everyone is against us. Above all the banks and media who did everything so that victory shouldn't come for us." The euro has just topped $1.10 for the first time since the U.S. elections, in early Asian trading, and climbed to a one-year high against the safe-haven yen which investors flock to when they perceive high levels of risk. Luck as much as talent has propelled Emmanuel Macron to the French presidency. The centrist will need both in spades if he wants to be acclaimed for more than defeating National Front leader Marine Le Pen. At best the 39-year-old will push through limited reforms. At worst, he risks undermining the presidential system that underpins the country’s Fifth Republic. Read more from Reuters Breaking Views columnist Swaha Pattanaik in her latest piece 'Macron may change change France in unintended ways'. France's CGT trade union calls for a demonstration on May 8 to mark the start of Macron's presidency. Jean-Marie Le Pen reckons his daughter's defeat comes down to her stance on the euro and the European Union. "It is the problems of the euro, of Europe, of pensions which have dragged down the campaign of Madame Le Pen, I think," Le Pen, who was expelled from the party in 2015, told RTL radio. "Congratulations Marine you can be very proud of a campaign centered on the real issues! 11 million voters thank you! Forward for France!" 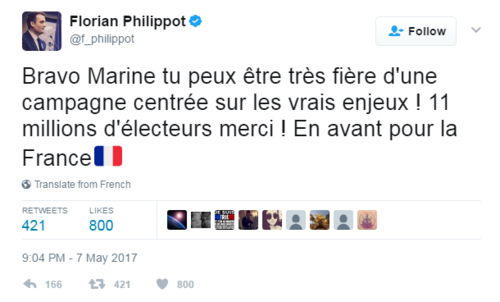 tweets National Front deputy leader Florian Philippot. He has said the National Front must be relaunched and the new party would change its name. European leaders hailed the victory of centrist Emmanuel Macron in the French election on Sunday as a vote for European unity and a blow to political forces that had sought to build on last year's Brexit vote to tear apart the European Union. It has taken only three years for Emmanuel Macron to rise from being an unknown government adviser to be elected France's youngest head of state since Napoleon. 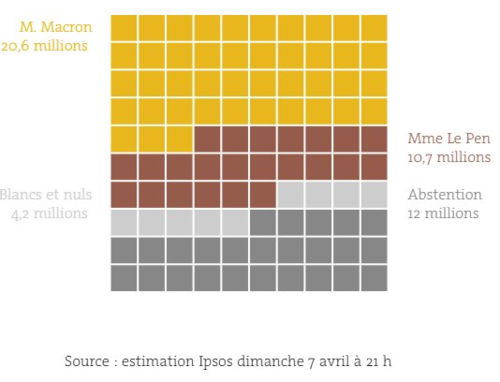 Le Monde's Les Decodeurs tweeted the below graphic showing the two candidates' vote share, and the high levels of blank and spoiled votes as well as abstainees. 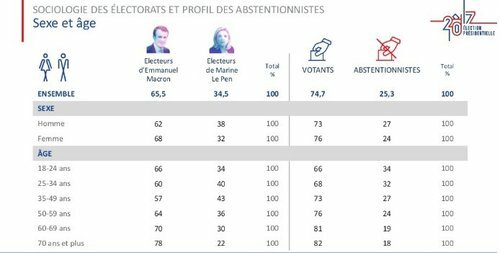 Blank and spoiled votes are projected to be at a record level, with abstention levels the second highest in the Fifth Republic, based on current Ipsos projections. 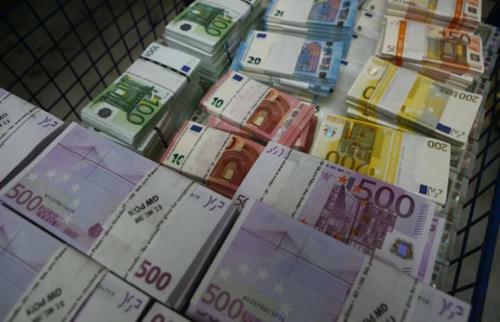 The euro topped $1.10 for the first time since the U.S. elections on Sunday and climbed to a one-year high against the safe-haven yen on relief that Emmanuel Macron had beaten the far-right Marine Le Pen to clinch the French presidency. 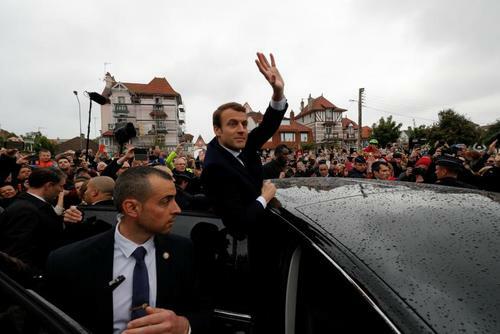 Early projections showed the market-friendly, pro-EU candidate Macron had been voted in with about 65 percent of the vote, comfortably defeating Le Pen, a nationalist who threatened to take France out of the European Union. While a victory for Macron had been widely forecast by polls, bookmakers and prediction markets alike, investors nevertheless were relieved that he had won so emphatically. In early trading in Asia, Europe's common currency rose about 0.2 percent to hit $1.1023 EUR=EBS, its highest since Nov. 9. The euro also climbed as much as half a percent against the yen -- which investors tend to flock to when they perceive high levels of risk -- to hit a one-year high of 124.58 yen EURJPY=EBS. The dollar climbed against the Japanese currency as well, hitting a seven-week high of 113.14 yen JPY=EBS. "Despite the uncertainty related to government formation and a potential implementation of reforms, the election result is a positive for Europe and markets from our point of view." Strobaek expects a short-term bounce in the Euro against the U.S. dollar and Swiss franc, since it already rallied strongly after the first round. Equity markets are likely to continue to attract investors, he reckons, with financials stocks expected to do particularly well. The spread between French and European government bonds, which had widened during the more uncertain times of the election race before compressing more recently, should diminish further. Behind the scenes in the press tent at the Louvre where Reuters cameraman Juris Abramenko is working with the team. It's very loud. Trade unions have issued warnings over Macron's victory, with one calling for a demonstration on May 8. "Force ouvriere" said Macron's labour reforms in particular would be a 'revealing first test' for the new President. The composition of a legislative majority will be crucial for reforms, including on labour, to be passed. 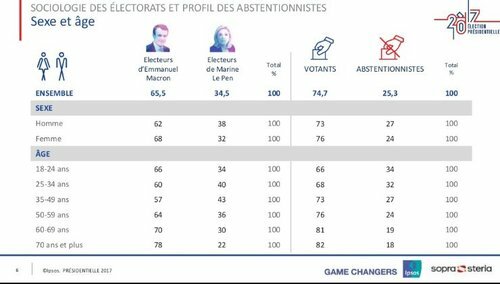 "Whether Les Républicains or En Marche come first, Macron will get his first batch of labor reforms through, despite the high likelihood of strikes as the main unions signal they are still an opposition force in their own right," says political risk analysis firm Eurasia. "Markets and investors will see this as a good sign, as the rigidity of work contracts has become a significant problem for France’s international reputation." Eurasia says the detail of the labour reforms had been withheld purposely by Macron's camp in order to guarantee a large second-round vote. But as these details begin emerging, his honeymoon could be short-lived. 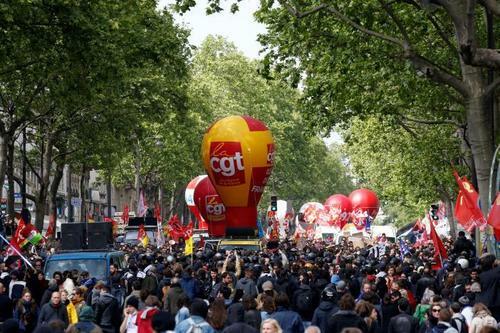 Trade unions demonstrate on May Day in Paris. The party is over at the Le Pen election venue. Reporter Matthias Blamont was escorted out as he was live on Facebook and thrown off the premises. Observers are already trying to figure out what kind of a Brexit negotiator Macron will make, and Sky News' Faisal Islam has dug up a Monocle interview with the president-elect in which he is less than complimentary about British foreign secretary Boris Johnson. France has a new president - Emmanuel Macron. Investors continue to express relief on the victory for Macron. They're almost unanimous in praising Macron's plans to cut corporate tax rates, and many are also speculating the result could lead the European Central Bank to normalise monetary policy by beginning to raise interest rates earlier than previously expected. "Equities will react positively - but mildly so - now awaiting to see if Macron in June has a new prime minister and parliament who share this young leader's vision for revitalising France. Shorts had largely been covered after the first-round result." "In the goldilocks scenario, Macron gets a working parliament and builds a partnership with Germany to launch meaningful reforms. 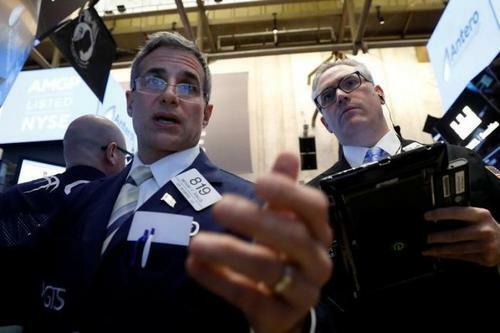 That would deliver a substantial boost to markets by year-end, which is currently not priced in. In either scenario we could see renewed market pricing for accelerated European Central Bank policy normalisation, especially if the [Eurozone economic] data continues to impress," says Bill Street, head of EMEA investments at State Street Global Advisors. Marine Le Pen's niece Marion Marechal-Le Pen, a National Front lawmaker, on Sunday said her aunt's softening of the party position on the euro came late in the presidential election campaign and was not well understood by French voters. But one fund manager thinks French government bonds could underperform once investors look through the political relief. Franklin Templeton's head of fixed income David Zahn says pressure will build rapidly on Macron to outline exactly how he intends to govern. He says there's been little in his manifesto that suggests he could reduce France's deficit or high debt-to-GDP levels significantly, and French government bonds could see some selling pressure with the gap between French bonds and German bonds growing wider once the initial relief fades and markets focus on fundamentals once again. Centrist Emmanuel Macron who was elected on Sunday to be France's youngest leader since Napoleon mostly relied on a small group of 30-somethings to plot his run for the presidency. France's biggest trade unions have promptly issued warnings over the victory of Emmanuel Macron, with one union calling for a demonstration on May 8. May 8: The president-elect makes a first official appearance alongside Hollande at Paris' Arc de Triomphe for the annual ceremony at the Tomb of the Unknown Soldier to commemorate Victory in Europe Day and the surrender of Nazi forces on May 8, 1945. May 9-13: Hollande's outgoing Socialist government resigns during this period, paving the way for the president-elect to take office the following week. Prime Minister Bernard Cazeneuve's government will continue to run day-to-day government business until the new president is sworn in. 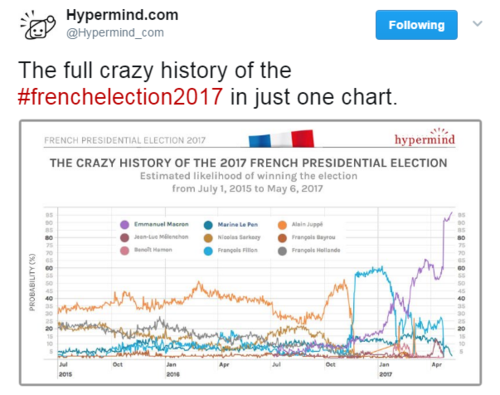 May 10: France's Constitutional Council officially announces the final results of the 2017 presidential election. May 13-14: The new president is likely to be sworn in by Monday May 15 in a transfer of power ceremony at the Elysee presidential palace where the two leaders will meet and the codes for France's nuclear weapons arsenal will be handed over. No precise date has yet been set for the ceremony, although local media have suggested May 14 is most likely. The president will then name the new prime minister who will work on forming a cabinet. In 2012, the full government was named within two days. Macron said his first trip would be to see troops based overseas. It is unclear when that could take place, but Hollande in 2012 travelled to Berlin on the same day as he was sworn in. May 15-19: Candidates from all parties will present during the week their credentials for the June legislative elections for the 577 parliamentary seats in the National Assembly. May 22: Campaigning begins for the legislative elections. May 25-27: Macron will have what is expected to be his first contact with foreign leaders. The new president is expected to first attend the NATO heads of state meeting in Brussels on May 25 before travelling to Sicily for a G7 leaders' summit that brings together leaders of the United States, Britain, Germany, Italy, Canada and Japan. June 11: The first round of the lower house legislative elections take place. Candidates with more than 50 percent of the vote and securing the equivalent of a quarter of registered voters is elected. Those with more than 12.5 percent of the vote can run in the second-round runoff. June 18: Second round of legislative election takes place. The top candidate is elected. June 19: A government reshuffle is likely on the basis of the legislative election results. Macron takes the stage at the Louvre, to Ode to Joy, the European anthem. "Everyone said it was impossible, but they did not know France!" shouts Macron to supporters at the Louvre. "France has won," a more relaxed-looking Macron tells cheering supporters in front of the Louvre museum. Those who said it wasn't possible "don't know France," he says.